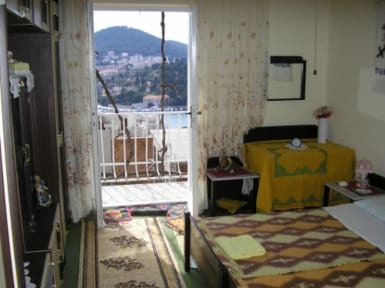 Our Guesthouse is in the center of Dubrovnik, between the Old Town and the Harbour. We offer 5 rooms in total with shared facillties. The rooms have a nice terrace and view over the Harbour. Dining rooms are airconditioned. Our small place has a good atmosphere, it is possible to have a nice time and meet people from all over the world. Our friendly staff will be happy to help you non stop. If necessary, a transfer from the Harbour or main bus terminal is available for free as well. Great location and really helpful host. Gave us lots of great recommendations. Would definitely stay again! We stayed with Nako at the Red Dwarf for three nights. He proved himself helpful, giving us his best tips for enjoying the city. Also, my friend got her backpack delayed by the airline; he offered to call the airport and lend her his phone. The last day he also took us to the bus station, as a small gift to us. The house is located around 30 min away by foot from the city center, but there are many buses that can take you back and forth. We recommend it! My stay in the Red Dwarf was great. It was very clean and comfortable. The host made it very clear on how to get into the Old Town and suggested places near by to eat. He was great! He drove me to the bus station in the morning which was very kind. Would highly recommend staying here! Nice place located about 40 minutes walking from the old city. Wonderful view and charming balcony from one of the rooms. Big and tidy rooms, but little bit overdecorated... Two clean bathrooms, Kitchen and everything you need. VERY eager to please and helpful host. Would have liked if there were less smoking and not so many ashtrays. Spent 4 days in Dubrovnik at the Red Dwarf. We had a nice room and a very pleasant stay. In our opinion, we got real value for our money. I stayed only two nights but the view from the hostel was amazing. The location is good, near the port. The staff was amazing and helped me with a lot of recommendations to visit in the city. I would definitely come back. Although it's a hike to get there, we had a good time in the guesthouse. 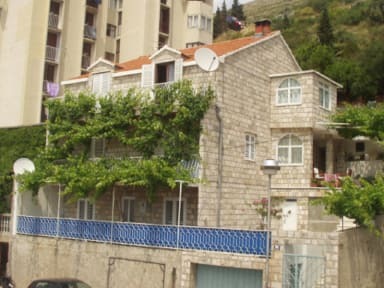 It's some min on foot from the bus station, the old town in in walking distance, there're shops nearby; have 2 nice balconies with view of the harbour, clean and safe place, the owners are really nice, helpful and welcoming people. Maybe setting an AC would be good yet. Anyway I'd stay here again in Dubrovnik. Host was kind and helpful, even giving us a lift to the station and always being on hand to give advice about Dubrovnik. The kitchen is very tiny so only choose this property if you don’t really care about being able to cook your own meals. There is only one bathroom for about 5 rooms which doesn’t seem enough and it could have been cleaner. The location is a bit of a trek from the Old Town. Having said all that, it was good value for money and it was fine for a few nights. Very far away from the city, kitchen was very dirty, had to pay in cash.